Roll a character die from your used pile. If it rolls a character face, field it at no cost. Otherwise, place it in your bag. Global: Pay . Swap the attack value of one of your characters with that of one opposing character. The Transfer Power global ability to field a character for free would be overridden if the selected character card has a Cerebro: Supercomputer die on it, making a character's dice cost a minimum of 2 energy to field. Transfer Power can swap applied effects, one time boosts from actions, global abilities, etc., onto new stats if the boost is used prior to using the action. For example, if the global on Basic Action Invulnerability was used to give a Sidekick +1A for a total of 2A, and the Transfer Power global is used to swap its attack with the 8A of a Hulk die, the boost from Invulnerability would carry over to Hulk's attack. In contrast, static effects, constants that modify stats if given conditions are met, continue to apply to the stat they reference. For example, if Green Goblin: Goblin-Lord is active, giving Sidekicks +1A/+1D, and the Transfer Power global is used to swap its attack with the 8A of a Hulk die, the static effect applies to the Sidekick's new attack value for a total of 9A. Magic Helmet: Greater Gear: Equip (attach to a character with ). This equipped character cannot be affected by your opponent's action dice or character abilities. 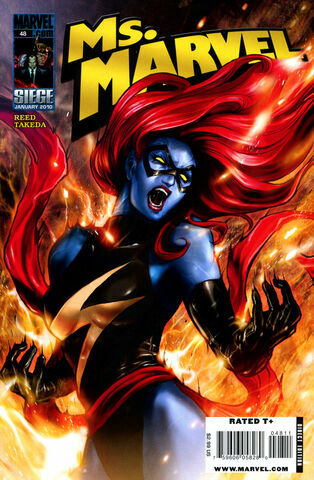 ^ Ms. Marvel Vol 2 48. Marvel Wikia Database. Retrieved 31 July 2015.